After seeing several hexagonal projects on LJ recently, I wanted to expand my comfort zone beyond rectangles. I’ve made several styles of desk/remote control organizers in the past and they have been popular sellers. Why not make a hexagonal organizer? I wanted to use some of my stash of jatoba that I got from Lumber Liquidators as 5” Brazilian Cherry unfinished flooring. 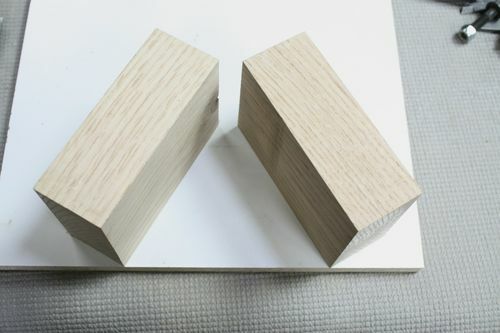 This wood is very nice without any defects, straight, and nicely figured. With the fluting on the back side planed away, I’m left with 5/8” thick stock. Lengths are from 12” to 72” and at about $4.50 sq-ft it’s a real bargain in my area. I had thought long about how to get the angles correct and finally decided on what is probably the simplest method. Cutting the 30 deg angles on the spokes with a 1/4” box joint blade set seemed the easiest. This allowed me to keep the side pieces with all square cuts. Only the outer sides needed to be carefully dimensioned. All parts should be batch cut with a stop block to ensure equal dimensions. The inner ring sides have arbitrary length which was determined to give an acceptable sized center compartment. Two spokes with one inner side are dry-assembled and placed in the jig. The jigs blocks assure the spokes are at a 60 degree angle. I make sure the joinery is tight, then measure the length between the spoke slots for the outer side. 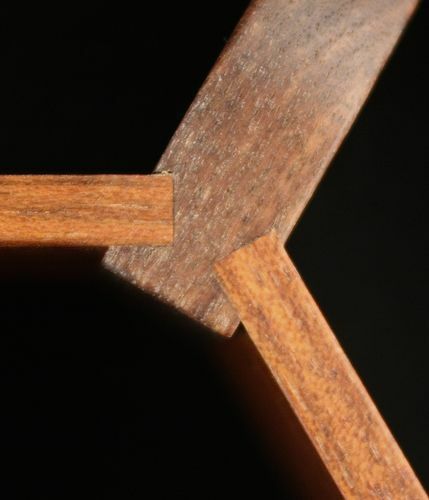 Measure this carefully as any errors will cause joinery gaps in either the inner or outer ring. I cut a side to the length I measured plus about 0.010” of an inch oversized. I then tweak the length to get a perfect fit. The glue-up is done in stages with epoxy for strength bonding the oily wood and stress relief by allowing more time for gluing, aligning, and clamping. Fun project! I made a second with cherry instead of walnut. All told, the entire project from wood selection to final glue-up took two days. I resawed my jatoba flooring in half to get the 1/4” stock. Order of operations is critical to getting the spokes right. The slots for the sides are done last since edge routing will cause chipping if the slots are cut first. Had some questions about the jig. I didn’t take any photos during the build, but here is a shot with some of the test scraps in place. 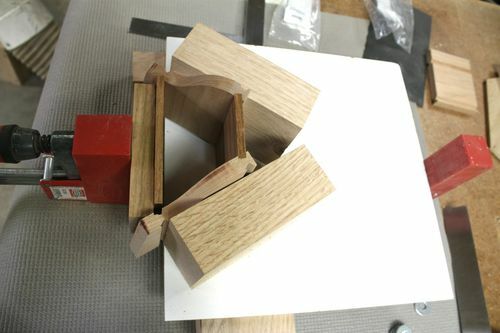 The parallel clamp wedges the sub assembly into the jig which forces the joints tight and at the proper angle. The outer side piece shown is obviously too short (all I had left for the photo), but when measuring for this part, the same jig holds the two spokes at the proper angle with the inner side seated flush in its grooves. spring clamps are used to hold the spokes to the blocks while I measure for fit of the outer side. I hope mine on the to-do list with maple and cherry look half as good as yours. WOW! 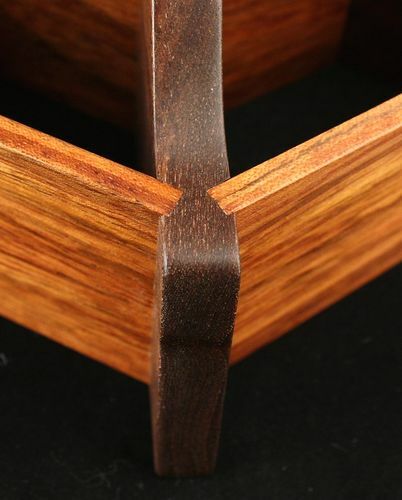 THIS IS EXTRAORDINARY SHAPE AND JOINERY! I like it!!! I have a box full of flooring left overs that I haven’t figured out what to do with. You are giving me some ideas. Nice work, interesting detail with the corners. Nicest looking remote caddy I’ve seen! Wood combo looks great, and the curves really accent the angles! a real eye catcher with wood combination not to mention the fine craftsmanship involved. You did a great job on this hexagon organizer. Congratulations! That is a great idea and should sell well. My grandkids would want to convert it for candy. -- "A goal without a plan is a wish." Old 1943 said it well! cool organizer, Bruce. Nice joint work!! Very Nice and Well Done! Thank for all of the details. Splint, superlative craftsmanship and unique, creative design! Do you actually know anyone that has 8 remotes? I like Ampeater’s candy suggestion and maybe on a lazy Susan. Amazing and beautiful, great craftsmanship and wood choice! That is really unique and very attractive.